Wall ties are an important structural component ensuring the stability of the outer leaf of a cavity wall against wind loads. The condition and number of wall ties in the structure are important and where corrosion has set in or wall ties are missing or broken, then remedial ties will be required. Solid masonry may also delaminate through broken headers or deteriorated mortar and require remedial tying to ensure future stability. 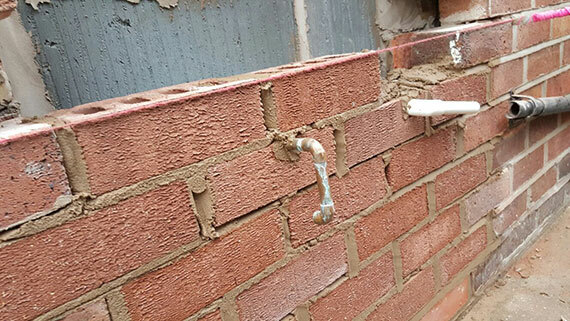 Wall tie failure occurs for a number of reasons, however the most common cause is inadequate materials being used when the wall ties were made. Wall ties are embedded into the outer and inner faces of the wall. When a steel wall tie corrodes (or rusts), it expands, causing the outer wall to crack and / or bulge. Cavity Wall Tie Replacements across Cheshire & South Manchester. Click here for a free, no obligation quote. For 24 hour call Out, call 0777 88 12934 or 0161 973 0540.